First, Jim explained that the key to good pie is keeping the crust cold. Therefore, you want your butter, shortening, or lard to start off cold, and you want to chill both the dough and the filling before you assemble the pie…or your dough will melt and slump instead of remaining light and flaky. So the order of the workshop was a little backwards, but it worked out very well. First, Jim demonstrated rolling out the pie crust. The secret, he said, was to use lots and lots of flour. If it tears or cracks, you can patch it, but never try to add water or lump it back together and re-roll it from scratch. 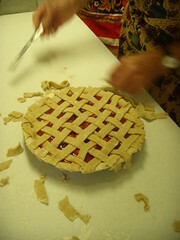 After putting the cold filling into the crust, you can either put a solid sheet of crust on the top, slashing it a few times to let the steam out, or create a beautiful lattice crust, as Jim demonstrated. Then we made pie filling. You want to cook it lightly – enough to get the fruit to break down a little and start to thicken, but not nearly so much as to turn it into jam. This helps ensure your filling will jell. 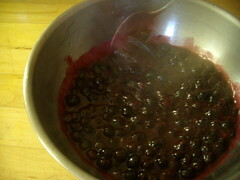 Our participants made pies from cherries, mixed berries, and even apricots! Finally, we made the crust. 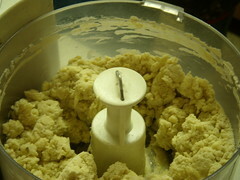 While you can do this by hand, a food processor with a steel blade really helps. This video demonstrates the technique of blending the fat (in our case, lard and butter) into the flour. Then we wrapped up our dough and fillings and chilled them (to be assembled at home later) while we ate the finished pie. It was sublime! 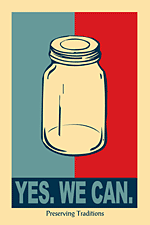 I’d like us to get on the schedule at the Grange for some “canning work days.” I’ve created a poll with dates from now until October. Please let me know what days you might be interested in joining in. I will reserve 3 or 4 dates between now and then, and we can get together with equipment and ingredients, and share the load and expertise! I imagine we’d do chicken broth, tomatoes, and maybe jam or fruit or pickles. Ore even kraut! Who knows…we’ll decide in smaller groups when we get some dates settled. You can take the poll here . Just type in your name or nickname and put a check on the times you can meet. You don’t have to sign up for an account, and you won’t get spammed by signing up (we use this service at UM all the time for work). I’ll post the final results here. I’m going to post links to this poll in a couple places. Sorry for the cross-posting; you only need to vote once. Hi, folks – I got a call from Edible Wow and they’d like to take some pictures this Sunday to go with the story they’re doing on Preserving Traditions. So I’m going to be at the Grange from about 1-3 the afternoon of Sunday, July 26th, canning raspberry jam. Feel free to come by, check it out, and/or do your own canning! It need not be raspberry jam, but it should be water-bath. Bring your own ingredients, jars, and lids; we’ll have a couple canners, jar lifters, etc.I hope to see you there! Pie class update: random fruit! It looks like cherries might be wrapping up for the season (you want tart cherries, not sweet cherries! ), so if you want to attend the pie class, and there are no cherries, just bring whatever fruit looks good in the market. Apricots? Peaches? Raspberries? Gooseberries? It’s all good! We’ll fill our pies with whatever’s fresh and awesome. There’s still room for Sunday’s class…sign up now!